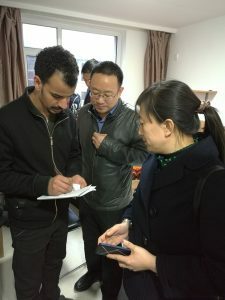 With the strong cooperation of all departments of the university, the second international student apartment has basically completed the repair and renovation, with the basic accommodation conditions for international students, and completed the relocation work of international students staying in the cuiying hotel at the end of February. To learn the returned student accommodation situation, help them solve the problem and the security issues, on March 7, the international cultural exchange school directly under the party branch secretary ze-bin zhao, dean of stabilizing just led the students management staff and students will further dormitory, one by one, visited the second student apartment dormitory, visited the condolences from extraction the hotel returned students, learned more about the room furniture, web services, kitchen stoves, washing equipment, classmates, learning life, and so on and so forth, encouraged students to actively adapt to the environment, continue to study hard. Useful tips & updates to prepare you for studying abroad.